Getting Published For The Third Time?! A little over two weeks ago, I wrote a Photo Friday post about the Holstee Manifesto poster and the fact that it has impacted my life, which can be read here. Four days later, I received a blog comment from Mary Shouvlin, a member of the Holstee team. She mentioned that Holstee is putting together a website that is made up of people’s’ stories of how the poster has impacted their life, and she asked me to include my story and a photo of myself to include on the website when it goes live. I was truly shocked at this amazing opportunity. Since beginning blogging, I never imagined that it could be such a wonderful way to connect with people and allow my writing to be recognized by so many people. The same day I received the blog comment from Mary, I sent her my story. I was so excited to finally get “published” again that I simply couldn’t wait even a day to express how the Holstee Manifesto has impacted my life. When I interned with the Columbia Star newspaper in January of 2009, I had 2 articles published. The first is basically my life story, and the article that I’m most proud of. The second, a commentary, was an article I wrote as if I was the SC Superintendent of Education. Though the second article wasn’t as personal, it taught me how to research a topic that I’d need to write about, which is much different from researching a topic that you’ve got to write a paper on for school. Anyway, both of the articles that I wrote for the Columbia star can be found here. It was an amazing feeling when I was first published. There’s something magical about seeing my words in print and being recognized for them. Even though what I’ve written for the Holstee site won’t be in print, it will still be connected with my name, and it’ll still be “published” since my name will be connected to what I’ve written, which will also include the picture of me that is on my “About Me” page on this blog. Anyway, I’m excited to be published for a third time, and I will be sure to let all of you know when the site goes live so that you can read what I’ve written. For information on how you can write your own story on how the Holstee Manifesto has impacted you, go here. A Dog’s Life: All You Need Is Love. I found out this afternoon that my first dog (who is very, very old now), Max, will need to be put to sleep tomorrow. Max has been living with my grandparents for a number of years, who live right down the street from us, because their dog, Joe, who was put to sleep last summer, was Max’s best friend. During the last few years that Max was living with us, he frequently got out of our yard and went up to my grandparents’ house to be with Joe. It reached a point where we realized that Max would be happier with Joe. However, we always showed him love on the days when he’d come down to visit us. Today I went down to my grandparents’ house to see Max one last time. My dad and I found him on the screen porch laying down in his cage. Due to Max’s age, he hasn’t been able to see or hear hardly at all for quite some time. Therefore, when Max had his back to us when my dad and I came into the screen porch, my dad had to reach in and turn Max around so that he was facing us. Even though I know that Max probably didn’t recognize us, my heart broke when I saw him. He didn’t seem to be in pain. He just seemed tired. I could see it in his eyes. Though he didn’t have the energy to move towards me, that didn’t stop me from holding him and crying harder than I ever have. Part of my heart broke this afternoon. For the loss of Max and for the amount of love that I have for him. Since he was my very first dog, he was my first indication of the amount of love that one can have for an animal. Max loved playing fetch. You could throw a tennis ball for him over and over again, and he’d never get tired. Often times, I was the one who had to eventually stop playing, even though Max would continue to drop the ball at my feet and look up at me with excitement and anticipation, wondering where I would throw the ball next. My dad brought a tennis ball with him when we went to see Max one last time today, and the fact that Max didn’t even have the energy to hold the ball in his mouth was heartbreaking. Max also loved water. Any time we would take him for a walk out on my grandparents’ farm, he would always run straight into the pond, no matter the outside temperature. He loved swimming, and when you added playing fetch while he was swimming in the pond, you could see that he was just happy as a clam. Though I know that after tomorrow Max will finally be at peace and will finally be able to be near Joe again (since Max will be buried next to Joe), it’s no easier for those of us who have to go on living without him. Though some people would make the comment that Max is just a dog, anyone who has ever had a dog knows that they aren’t just a pet. They are a part of your family. Heck, in our family, our dogs (Max, Roxy, and Hoss), who are all springer spaniels, have had their own Christmas stockings for as long as they have been in our family. They are one of us, and that’s all there is to it. Though I am sad to lose Max, I am happy to still have Roxy and Hoss to show my love to. When I came back from saying goodbye to Max today, I curled up on the couch and held on to Roxy as I cried. I figured she knew something was wrong since she looked up at me and licked my face. Even though that made me cry harder, I don’t know what I would have done if I would have lost Max and then had to come home to a house without dogs. It would make things so much harder. 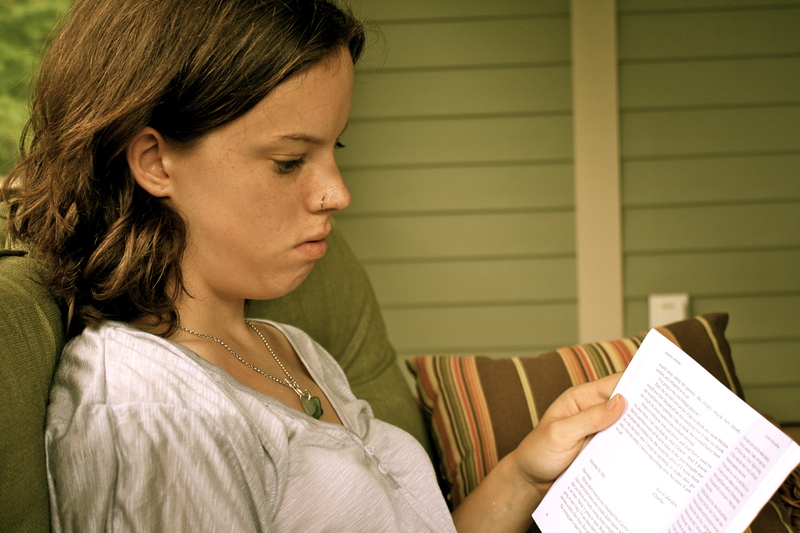 One of the only pictures I have of me reading, but it's so typical, and it's also fitting since I'll be doing lots of pleasure reading this summer. Well, I’m officially done with finals and moved out of my dorm. I’ve just got a short paper due on Monday that I’ll get done this weekend. Even though I’m very happy to be done and have the stress melt away, it was sad saying goodbye to my friends (especially 2 of my friends who are exchange students from England). I have loved my first year at UNCA (but second year of college). It’s been so amazing. I’ve made some of the most incredible friends….ya know, those kind of people who you know you’re going to be friends with forever. It is such a great feeling, and I’m so happy that I got the opportunity to find a place where I belong. I know it takes some people a while to find that special place, while others seem to just be thrown into it…ya know, the people who just love a place from the start. That’s how it was when I visited Asheville for the second time though. I knew that it just fit me so much better. I was nervous as usual, but everyone gets nervous when it comes to new experiences. Anyway, even though I won’t be technically on summer vacation until I write this last paper, I am eager to do lots of pleasure reading and have the chance to enjoy living in the mountains and not being bothered with schoolwork. It’ll be such a great change (at least for a little bit). Tomorrow I’m heading to Columbia to talk to one of my previous physical therapist’s graduate physical therapy classes about how things have been for me having CP. Though I have gotten better at talking openly about my CP over the past few months, the thought of standing in front of a class of graduate students and talking about my life is a little scary. I’m not exactly sure what I’ll say. However, I am pretty sure that Meredith (my previous physical therapist) will try to make it as easy on me as she can. However, that doesn’t take away from the fact that I’ll be standing in front of students talking about myself. Though CP is a huge part of my life and I do want to share my story with the world, I’ve never really liked talking about myself too much. I just never want to take away from the possible things the other person I’m speaking with may be able to teach me (in regards to their own life). Friendship, and communication in general, is a two-way street, and I think many people forget that. Anyway, tomorrow will be interesting to say the least. However, I’m excited to hear what the students have to ask me and to hear what they are currently learning about. Since I had 15 years of PT, I feel like a pro to the terminology when it comes to comparing my knowledge to someone who has no background/experience with PT. However, it’ll be interesting to see what the PT students know in comparison to my own knowledge. After all, it’s never considered a bad day when you have the opportunity to learn something new. To Grace (Part 2): Walking Through The Fire. Since I got such awesome feedback from the first post I wrote To Grace, I decided to write a part two. Who knows…this could just be the beginning of posts I write out to kids who have CP just like me. But this “letter” in a sense is simply reflecting on what I have gone through while having CP. By addressing it to Grace, I am connecting with someone I know personally who also has CP. However, this can apply to anyone who has CP, so I’ve decided to not include a “To:” line, and instead, I’ll just jump right in. First things first, don’t be afraid to cry. I know that you have been faced with so many struggles and you feel like you need to act like you’re not afraid so that other kids who don’t understand will refrain from taunting you. However, you can be afraid. I know that you don’t want to, but you shouldn’t feel bad about being afraid. If anyone else was in your situation, they’d be terrified. Anyway, as I said before, don’t be afraid to cry. I know that you want to be strong for your family and your friends, but crying doesn’t mean you’re weak. Sometimes, it means you’re that much stronger because instead of holding back how you feel, you’re letting it out, tears and all. Find your own sense of security, something that makes you feel safe. For me, that was my stuffed animals. For every one of my surgeries, I took a stuffed animal into the operating room with me. My stuffed animal of choice even got a hospital band of its own so that it was like we were experiencing the pain together. When you split fear or pain between 2 people, even if one of them isn’t a real person, it’s as if there’s someone holding your hand as you walk through the fire. I mean, it doesn’t make a huge difference….but it could be the difference in feeling like you have a friend beside you and feeling totally and utterly alone. Find a release. Whether it’s watching tv, reading a book, or writing in your diary…find something that can get your mind off of things for a few moments. Trust me, I know it’s easier said than done. When you’re in the hospital or you’re going to PT, all you can think about is the fact that in a little over an hour you’ll be crying. And you wish that just for one day, you could not end up hurting so much after that hour of PT. I know how hard it is. I’ve been there. In your mind, you wish you could be anywhere else, and in your mind, enduring that pain, even for only an hour, is the worse kind of pain. That’s why it’s good to find some sort of release. Some way to let out some of the anxiety. I’ve suffered with a lot of anxiety throughout my life, but it was especially bad when I was going through all my surgeries and PT. My way of letting out my anxiety was through writing. I’d write about what I was feeling. I’d write about the fact that I wish I could be anywhere but on my way to PT. I’d write about how much it hurt, and how I wished that there was someone who could understand. I’d write any and everything, and even though all the pain and fear was still there when I was done, I was happy that for a few precious moments I was able to vent to not a person, but to something that seemed more trusting at the time: a blank sheet of paper. Lastly, probably one of the most important things I could say, is smile. I know it seems like such a simple task, but some days, even though they could be few and far between, are good. Some days aren’t quite so tough, or rather, parts of some days aren’t as tough. Smile during those times. Though it may not seem like it, you are so awesome. You’re facing a level of pain that few people can even imagine, and best of all, you’re getting through it. You’re not letting it tear you down. Yes, lots of days are hard, but you’re fighting. That counts. Rather than sitting on the floor feeling sad that you can’t do things as well as other kids, you’re standing there trying to figure out how you can do it in your own way. It may not be perfect, but guess what? It doesn’t have to be. All that matters is that you’re walking through the fire that’s your life, but instead of standing around and letting the flames consume you, you’re running straight into the flames and that, my friend, is so freaking awesome! Tuesday’s Tunes: John Butler Trio. I’ve always been a fan of the sound of acoustic guitars. I just love the emotions that such a simple instrument can bring to the surface for me. I actually was given an acoustic guitar as a graduation gift from my parents when I graduated from high school. I haven’t learned how to play yet, but it’s something I’d love to learn when I’ve got the time. Since I love to write and I enjoy singing, I could see myself really loving it. However, even if I didn’t write my songs and sing them, the simple sound of acoustic guitars just makes me melt…so learning to play would be all that I would truly need. My brother told me about the band, John Butler Trio, a while back. The first song he told me to listen to was “Ocean,” and I’m so glad I did. There are no vocals, but sometimes I like that (depending on my mood). It’s some of the best acoustic guitar playing that I’ve heard, and I just love it. Have a listen and let me know what you think.